You can be forgiven if you are not a fan of NHL.com. The website is very busy and crowded, and easy to get overwhelmed, and there's tons of other, more impartial sites out there. But NHL.com does have some of the best feature writing and feature writers in the business working for them. For a long time I've been faithfully reading Bill Meltzer's "Across The Pond," Phil Coffey's "Ice Age" and Evan Weiner's "Off The Wall." Another favorite of mine is Risto Pakarinen's contributions to the NHL.com blogging community Only now I've found a more enjoyable and completely new experience in reading it. 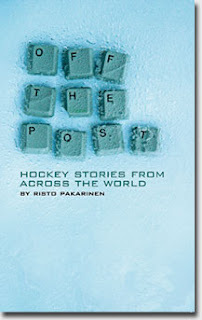 Pakarinen has published his blog entries into the book Off The Post: Hockey Stories From Around The World. Pakarinen is no stranger to the hockey world. He's a die hard fan who turned his obsession with pucks, ice, Valeri Kharlamov and Wayne Gretzky into a career of journalism. The Swedish-based freelance journalist from Finland is a regular at NHL.com and The Hockey News. He's also covered tournaments such as the world championships and world cups. His writing is unique, simple and elegant. His book is far more than a collection of posts from his NHL.com blog. Each online posting is by itself, an experience to be enjoyed in the immediate moment. But when you pick out the best and put it into a book, Pakarinen's contributions become an entertaining and thoughtful archive of the past couple of years. But it also offers so much more. It also serves to eliminate any myth that Europeans can not be rabid NHL fans like Canadians can be. The book quickly sets the scene for us North American fans that the European fan experience has some differences and challenges. But the book quickly proves that in many ways there is no difference between hockey fans worldwide at all. Other than those pesky time zones. Beyond the excellent posts on the happenings of the day, an astute reader can enjoy Off The Post as a journey that must be experienced. It is very much Pakarinen's journey, as hockey for him is a lifestyle. The best part about the book is whenever Pakarinen allows himself to get personal and reflective, sharing childhood memories and wearing his current emotions on his sleeve for all to see. It's a great, quick read, full of personality and obvious passion for the game. I think the book format of Pakarinen's blog posts works far better than anyone could have imagined.